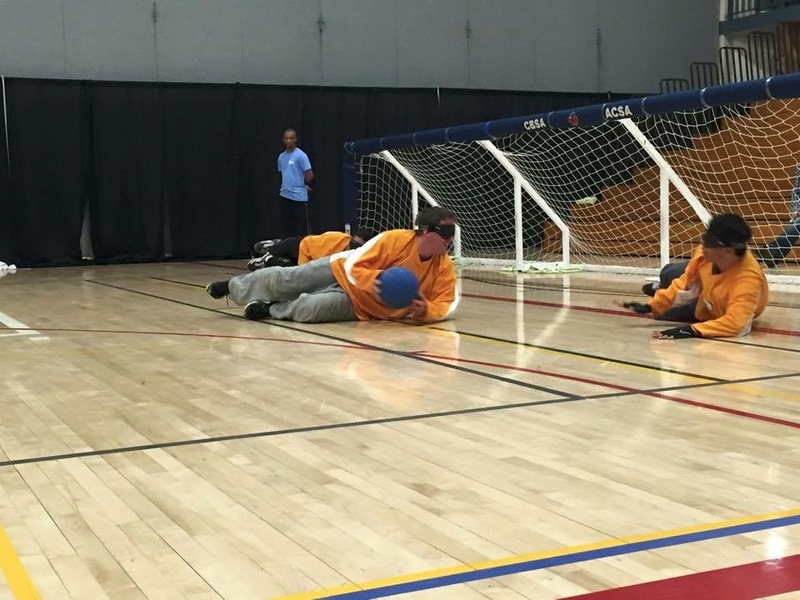 Goalball is a fast-paced team sport designed specifically for blind and visually impaired athletes. We welcome visually impaired and sighted players alike to explore goalball with us. We welcome players 16 and older, and accommodate recreational and competitive athletes alike. (Younger athletes who wish to explore goalball should check out the Young Athlete Development Program). The sport requires players to play both offensively and defensively at the same time, protecting a 9 metre (29.5 foot) net, and attempting to score on the opposing team’s net 18 (59 feet) metres away. The ball is about the size of a basketball (but heavier and less bouncy! ), and contains bells to help players orient to its location. Similarly, court markings are slightly raised using floor tape to help athletes determine their location on the court. All players are under eyeshade, which means blind, visually impaired and sighted players can play equally. Lead by head coach Kerri MacKay and assistant coach Jessica Paturel, our goalball program runs Sundays from 12-2 pm. Contact Kerri at km.goalball [at] gmail.com for details. We also welcome kinesiology students in Adapted Physical Activity to join us for their practicums. Please contact Kerri for details. Kerri MacKay has coached the Manitoba Goalball team since October 2014. Kerri has a Bachelor of Physical & Health Education from the University of Winnipeg, and has special interest in sport and exercise promotion for athletes with a disability or chronic disease. Kerri’s National Coaching Certification Program training includes Goalball – Competition Coach, Run Jump Throw Wheel – Instructor and Special Olympics Competition Coach. Jessica Paturel has been the Assistant Coach of the Manitoba Goalball team since March 2016. Jessica is currently completing her Bachelor of Science in Kinesiology at the University of Winnipeg.